Greetings in the name of Christ. We are writing to thank you for the generous contribution you made to our recent missions trip to the Parish of New Town, Suva in Fiji and share with you the following report on the benefits of this trip and the proposal we will be putting to our parish Vestry when they next meet. 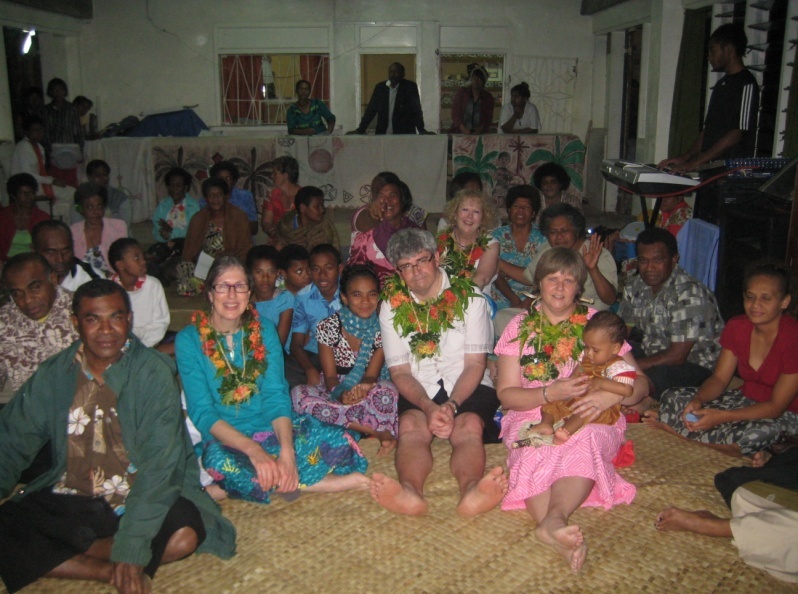 As you are aware from our application, the group who travelled to Fiji was intentionally small as this was a preliminary visit to hear the Talanoa (stories) of the people and to discuss face to face with the appropriate leaders what a parish to parish and school to school relationship may look like going forward. At the beginning of the planning process for the St Mary’s/Samuel Marsden Whitby visit to Fiji three specific goals were identified. These are the goals that were also shared in our TPMC application. To develop an ongoing relationship with St Mark’ church New Town, in order to actively support the work they are doing with the landless Melanesian people. To develop a relationship between the youth of St Mary’s Church and the youth of St Mark’s church. To develop a relationship between the students of Samuel Marsden Collegiate School, Whitby, and those of Basden College and Bishop Kempthorne Primary School. The parish of St Mark’s in the greater Suva area is made up of four worshipping communities: St Mark’s New Town, St Gabriel’s Laqere, St Bartholomew’s Caubati and St Philip’s Nadawa. While in Fiji we joined with the whole parish for worship on Sunday morning and then attended a service led by the youth Sunday evening. During the following week we spent time in each of the worshipping communities listening to their talanoa, as well as visiting the Anglican Schools in the parish, meeting with a manager from the Fijian Housing Authority and visiting one of their subdivision projects, meeting the staff from The House of Sarah and meeting with Jo Sanegar from Anglicare of the Diocese of Polynesia. There are many faithful people in the New Town parish. The worship was incredible, particularly from the children and the young people (photo on the right). They have a good number of 16-25 year olds in the parish, many of whom demonstrated a variety of leadership skills. The Vestry and Vicar (Archdeacon Jone Teana) expressed a desire to see their youth grow in their faith through involvement in short term missions. The majority of the people live in squatter settlements. While they have been on their land for many years they risk being told at any time that they are required to pack up their homes and move on. The people of Namara, who have lived in their settlement for over 100 years, are being moved to a new residential area early next year. While thanks to the Diocese of Polynesia and AMB their new lots will be secure tenancies, they are grieving terribly. The government Housing Authority who are developing the new subdivisions have a real heart for the people and are doing everything they can to ensure squatters can be housed elsewhere if they need to move. Few adults are employed and many communities live on subsistent incomes; when the weather is settled enough to fish or if the taro crops have produced well, they have something to sell on the side of the road. Some of the people are well educated but many have only received a low level of education and find it difficult to secure employment. Next to land security and employment, the other great need voiced by whomever we listened to was education for the children. A number of children have not been attending school because the parents cannot afford to send them. The Anglican schools in the parish, Bishop Kempthorne Memorial Primary and Pre-schools and the Basden College all appear to be under-resourced (common for schools in Fiji) but the teaching staff we met all appeared very competent, dedicated and highly committed to serving the children from the poorer communities that feed into their schools. The leaders and people in each of the worshipping communities that make up the parish expressed often their appreciation that a parish in New Zealand is interested in partnering with them and their desire for the relationship to be ongoing. The following proposals came from the people’s talanoa and discussions between Reverend Sandy Williams (Priest in Charge) and Sharon Callaghan (Missions Motivator) from Whitby and Archdeacon Jone Teana from St Mark’s New Town. They have been approved verbally by the wardens and members of St Mark’s Vestry. That the Parish of Whitby begin fundraising to assist the vestry of St Mark’s to establish a fund to support families in need with the costs of their children’s education (for example the payment of school fees, purchase of uniforms and school books). That the youth of St Mark’s prepare for a short term missions trip to Whitby in 2013. It was felt important that the youth fundraise to cover their travel costs. All costs during their time in New Zealand will be met by the parish of Whitby. That the parish of Whitby prepare a short term missions trip to New Town Suva in 2014. As well as this proposal Anne Winnall (Director, Samuel Marsden Whitby) has also formulated a proposal with the Acting Principal of Basden College for an ongoing relationship which she is taking to her school’s Principal and Board for their consideration. So far we have written a report for our Diocesan weekly bulletin and will be sharing at a Diocesan ‘Spring into Overseas Missions’ Day in early September. I am also keen to discuss this with the clergy in our archdeaconry to potentially widen the relationship. We are very grateful for the generous donation toward our costs from the Tikanga Pakeha Missions Council. While we found transport around Suva was greater than that budgeted (we used the most common form of transport which was taxis), thanks to the grant we received we were able to gift to the Parish of St Mark’s $550 (NZ just of $400) toward the establishment of an education fund. We would again like to express our gratitude for the generous donation made by your council that has enabled the establishment of what we pray may be a long standing relationship between the people of the parish of St Mark’s and the people of the parish of Whitby as well as the staff and students of Samuel Marsden Collegiate School Whitby and Basden College.